Notes: Financed by interworld recording superstar Lucas, Deveckler Enterprises is Luke’s attempt to “give back” to the planet that has given him so much, and if he just happens to make a financial killing in the process, who is he to blame? Immediately following the signing of Deveckler’s papers of incorporation, Luke hired his old high school classmate, Devon, to head the firm’s day-to-day operations. Devon’s penchant for getting the job done, regardless of details such as legality and financial legitimacy, made him a perfect candidate to leave Earth and relocate on Kerbin, where even the word “extradition” is so hard to pronounce the Kerbal society avoids the concept altogether. In need of technical support, the team also pulled in Dr. Charlie, an engineer of tremendous skill and talent whose is loved on Kerbin for his Kerbal calligraphy skills. In fact, his writing is so revered that the trash from his office is oftentimes stolen by the Kerbal Mafia in an attempt to sell his post-it notes as art on the Kerbal Black Market! Due to the influx of off-world investment and potentially “shady” directors, Deveckler Enterprises is required to pay a 10% foreign enterprise tax on all purchases (all vehicle costs go up by 10% from list price), and any fines or penalties have a hefty 50% foreign processing surcharge. Design Goals: We have a simple design that breaks off into 3 pieces. 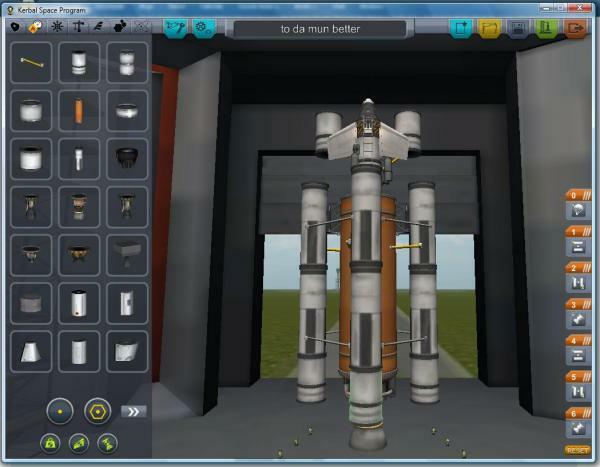 Launch Goal: Our vehicle is designed to launch a glorious kerbin into orbit around the planet! Pilot Plan: Initially the pilot will steer straight up. At 10km the pilot will pt the spacecraft at a 45 degree angle. Once the apoapsis reaches 100km, the pilot will kill the truster until it reaches the apoapsis. At this point, the pilot will burn the trusters putting the aircraft in orbit. Looking forward to seeing the screenshot of your rocket. Once you reach apoapsis, on what heading will you burn to put the craft in orbit? I approve! Nice job charlie eckert and devlecker enterprises. Play-by-Play: Rocket launch with no issuies. At about 15km the first seperation occured. At this point we were had very little atomphere or gravity pulling us back. Because of this the small fuel tank on the last part of the engine was sufficent to reach orbit. Once the apoapsis reached 100km, i set a new cource for orbit! 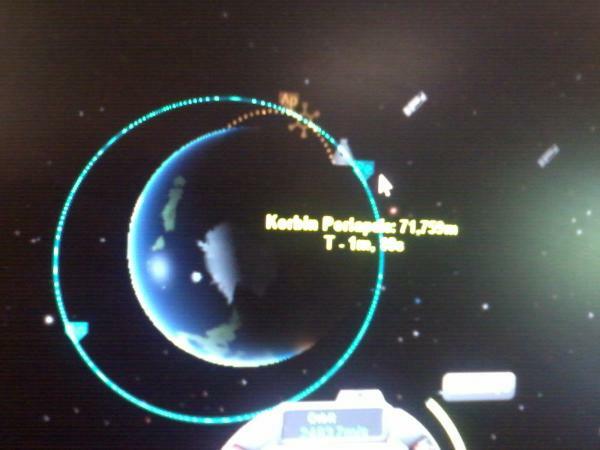 unforchently I didn't realize my periapsis was too low for orbit. forchently I had enough fuel to correct the orbit. the current periapsis is 71 km above the earth! Summary: We succesfully put a kerbal into orbit. It was a good day. 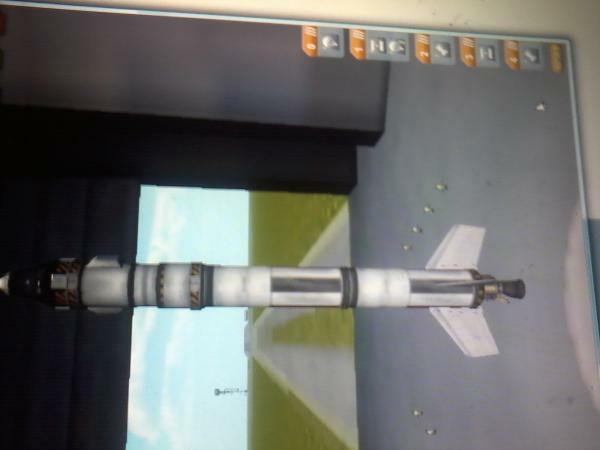 Opportunities / Learnings: I learned how to accualy build a rocket and that luke rocket was way too big. Strategies / Project Timeline: The money will be very useful for future goals. You can take screenshots in-game by pressing f1. f2 removes the HUD. Great job on reaching orbit! For some reason the F1 key wasn't working for him today, so we had to resort to the cell phone camera. Hoping that gets fixed up upon reboot. 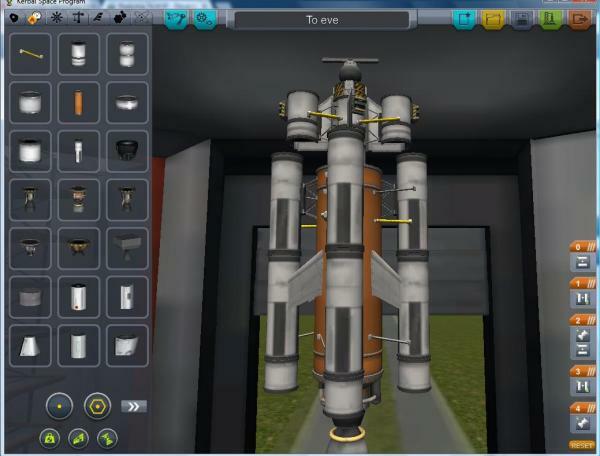 As your poor kerbal is trapped in orbit for now with no fuel to return home perhaps it may be an idea further down the line to attempt a rescue mission where you could bring a seperate pod for him to be returned home in. Get used to orbits first though. In future you may also consider adding a docking port somewhere on your craft so that if similar tragedys were to happen, not only could you save the stranded astronaut, but you may learn how to rendezvous in orbit in the process, refueling the ship (with docking port) would allow you to deorbit and save his ship too getting you some funds back for the recovery of his ship parts. Charlie, Please learn how to grammar. And spell. Design Goals: The vehicle is designed to bring a kerbal to the Mun and back preferably in one peice. 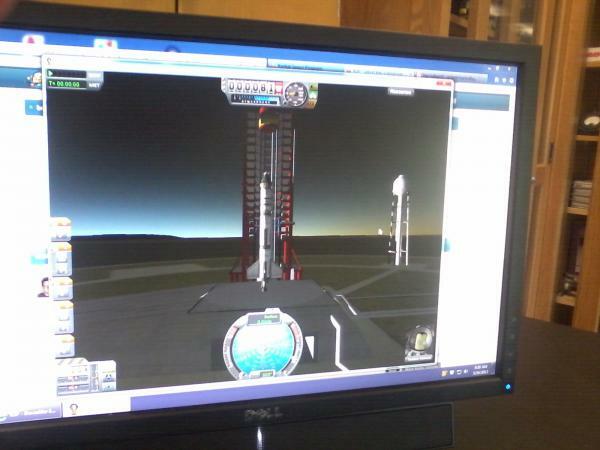 Launch Goal: We hope to achieve the mun landing milestone. Pilot Plan: Full throttle for as long as possible before overheating kicks in. Drop the four side fuel tanks once the fuel runs out. At 10 k angle the rocket to the side. Once the apoapsis reaches 80ish km, the pilot will kill the throttle until we reach the apoapsis. At the apoapsis, we will burn the reamining fuel in the Jumbo Tank to establish orbit around kerbin. From here we drop the tank and burn at pro-grade once we can see moon while orbiting kerbin. This will lead to a ‘collision’ with the moon. Once a we are close enough, we will establish an orbit. Then we will burn retro-grade to slowly bring us to the surface of the moon. Finally we can return home doing the same thing. NO GO!!!!! Your fuel use is ridiculously high and inefficient. You will waste a ton of money on parts that will just crash back down on Kerbin because you don't have parachutes on them. And you will kill your Kerbal because there is no parachute on his cockpit. Rethink this one before launching. I'm saying yes but I'm probably going to regret it. Deveckler Enterprises receives a $10K government fine for a moon crash incident resulting in the avoidable loss of Kerbal life. Further flight plans involving extraterrestrial landings should include lighting plans. I attempted to land on the dark side of the moon. I was unable to judge distance properly and crashed. Added lights and and batterys. Will reattempt with brendon aproval. I approve this new flightplan. Hopefully the lights will help you out should you need to land on the dark side of the moon. Take pictures! Rocket launched at full burn. Throttle turned down to prevent overheating. At 10km, dropped the side boosters and turned towards 45 degrees. Once apoapsis reached 90km we killed the engine. Used remaining fuel to establish an orbit with 85km and 105km at lowest and highest point respectively, then dropped the jumbo tank. Once we saw the moon while orbiting the kerbin, we put on full burn and waited to a collision point. Then we established an orbit around the mun. Then we burnt retrograde until we landed on the mun. During our mun decent, I accidently dropped fuel tanks that still had fuel. Fortunately we had enough fuel to land and come back. Summary: On first attempt we made it to the mun, but crashed because we couldn’t see the ground. We added lights and batteries to our rocket, but we ended up not using them because we landed on the light side of the moon. Returned home: mission successful. Also my kerbin showed promise as an acrobat. Opportunities / Learnings: What "big picture" items did the team learn from this launch? Strategies / Project Timeline: This will give us the nessaray funds to pay for future missions. Congratulations on your $280,000 award for Landing on the Mun and returning safely! Design Goals: The vehicle is designed to orbit eve. Launch Goal: We hope to achieve the milestone for orbiting another planet. Pilot Plan: Full throttle for as long as possible before overheating kicks in. Drop the four side fuel tanks once the fuel runs out. At 10 k angle the rocket to the side. Once the apoapsis reaches 80ish km, the pilot will kill the throttle until we reach the apoapsis. At the apoapsis, we will burn the reamining fuel in the Jumbo Tank to establish orbit around kerbin. We will burn throttle to break away from kerbal orbit into the sun’s orbit. From there, we will readjust to ‘collide’ with eve allowing us to set a new orbit around eve! Safety Rep: Brandon? Brendan? Liz ? Looks really cool. I would say youre good to go, lets just hope your pilotting skills have improved. Looking forward to reading the mission report as well as a detailed mission plan for the next attempt. Also, team is expected to plan how they'll intercept extraterrestrial planet. Play-by-Play: mission failed, I forget to put out the solar panel before time warp. This resulted in running out of charge preventing us from operating the ship. Opportunities / Learnings: I learned that I should slow down and plan out future missions. Also i should have a group memeber remind the pilot of important things like extening the solar panel before going into time warp. Good learnings... looking forward to seeing how your next mission goes with more detailed planning!